I mentioned yesterday that school starts for both of my kids on Monday. That means my daughter will be a freshman at Penn State, and my son will be starting seventh grade. Needless to say, we are definitely in back-to-school mode which means over the next 10 months, I'll be making lots of lists and tracking many activities. And that's where the BUSY FAMILY 2018 PLANNING CALENDAR will come in handy! This 17-month calendar (which runs from August 2017 through December 2018) has everything a busy family needs to be organized. This wall calendar is really adorable... and of course, practical. Each month has a large calendar grid with different colored lines on each day. These lines can be used for each family member's activities, but I just like that they make my to-do list easier to read. The BUSY FAMILY 2018 PLANNING CALENDAR is a terrific. The whimsical artwork is positively adorable with different scenes for the various months. For example, August has some sea creatures while January has some woodland animals. In addition to the cute artwork, the calendar includes reminder stickers for birthdays, doctor and dentist appointments, half-days, and more. There are also fun stickers for school breaks, family fun time, and vacations. And this might just be my favorite "mom" part of the calendar -- there are stickers for chores and dinner that are large enough to customize. I love the BUSY FAMILY 2018 PLANNING CALENDAR and I think it would be a great help to busy families! Highly recommended! 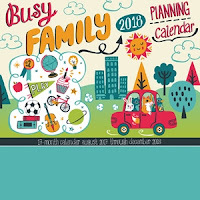 You do have a busy family - that calendar looks perfect for you.